After planning, researching, measuring, cutting, applying gesso, designing & painting, hunting down the right (zero VOC) polyurethane, applying said polyurethane, then applying more polyurethane, then still more...the floorcloth is finally finished!! 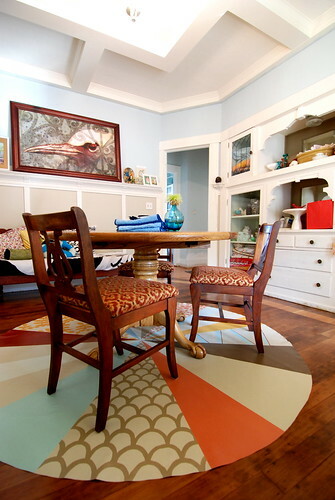 The process was really fun and it's very rewarding to now have a floor covering in our dining room that is beautiful & durable, and that I made myself. It's also pretty sweet that unlike a regular rug I can simply wipe off the gunk that Bird spills on it throughout the day. I wish I had had a larger piece of canvas to start with. I used my largest remnant but it still only got me 7' diameter. Sounds big, but now that it's under the table it seems smallish. No biggie. Someday we plan to make a larger top for the table (and I'd love to paint the whole table white...yes, really, Jared would be quite unhappy with me...) but till then I think it works just fine. Maybe in the future I'll find another spot for it...it's always fun to move things around. Thanks for coming along the floorcloth making journey with me! It feels so great to accomplish these kinds of projects. I have to remind myself that even if I don't have tons of time, if I just apply myself in short spurts and chip away eventually things will get finished. And that's a real boost for the next thing in mind. I made my first papercut! I love Elsa Mora's work and she is such an inspiration. She is amazing at whatever she touches it seems, and one of the things I appreciate is how many mediums she works in & types of artwork she creates with. It's always apparent that it's Elsita's work...whether drawing, painting, jewelry, collage, or papercutting! 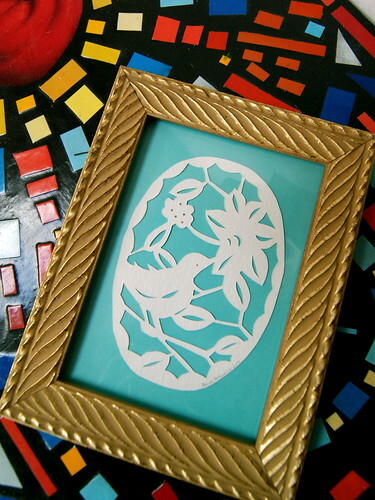 She even created a separate blog from her original blog devoted just to the art of papercutting. And we have a print of one of her papercuts in our office. They're gorgeous...you can find them in her shop. My mom's birthday is today (happy birthday!!!) and I wanted to make her a special piece of art she could have on her desk at school (my mom is a teacher) or on the wall at home. I really wanted to try papercutting so I created this piece with a bird in a honeysuckle vine. The process was totally different than working on a floorcloth and it was refreshing to go from something very large to something small and precise. It was a little unnerving to make the tiniest of cuts and I did have one oops! but it's very difficult to find (please don't look too closely, haha). After cutting it out with a curved x-acto blade, I used a tiny awl point to make the round holes in the flower blossom and the bird's eye. Then I applied adhesive to the back (I used a ballpoint-tip glue pen) and mounted it to a bright spring blue paper (an intense robin's egg blue almost) and put it into a thrifted frame (I'm always on the hunt for frames). The papercut is cut from a heavy & beautifully textured watercolor paper. It's yummy.